In honour of the many Friends of the Royal Academy who have kindly looked at my blog today (I’ve had record numbers of visitors) I am doing a second post related to the history of the Summer Exhibition. 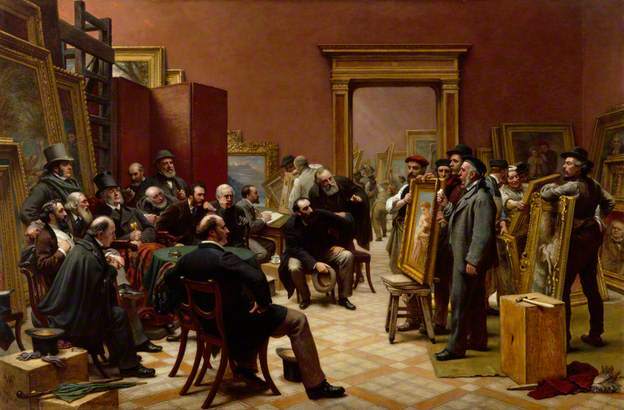 It’s a picture of the process of selection as painted by Charles West Cope in 1875. It’s one of the stars of the exhibition of our collection currently on in Bendigo outside Melbourne, Australia (see previous blogs). It tells one so much about the nature of the high Victorian RA. The artist was named after Benjamin West (his sister was named after Turner) and he was Professor of Painting in the Royal Academy Schools. He is in the background, bald and bearded. The then President, Sir Francis Grant, leans back in his chair, whiskered and supercilious and wrapped in a rug. In the front, Millais has taken off his top hat and put it on the floor in front of him. My predecessor, Sir Frederick Eaton, is dutifully taking notes. The whole scene exudes a sense of the authority that the Academy held in 1876, when the Academicians were all wealthy, selling their works to industrialist and nouveau riche collectors.